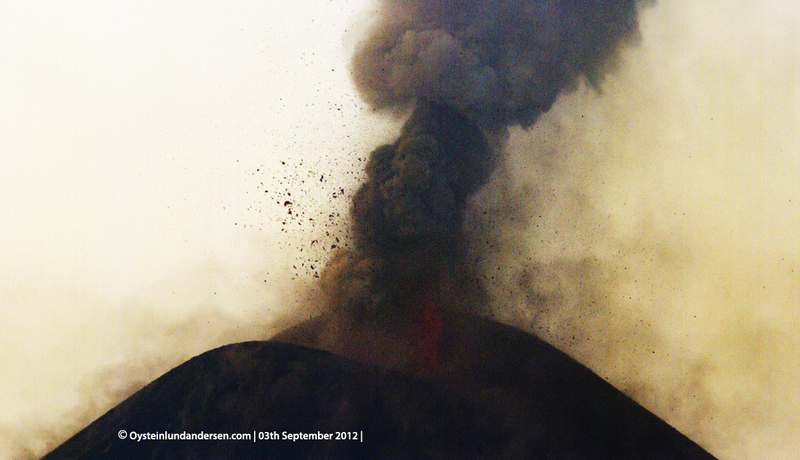 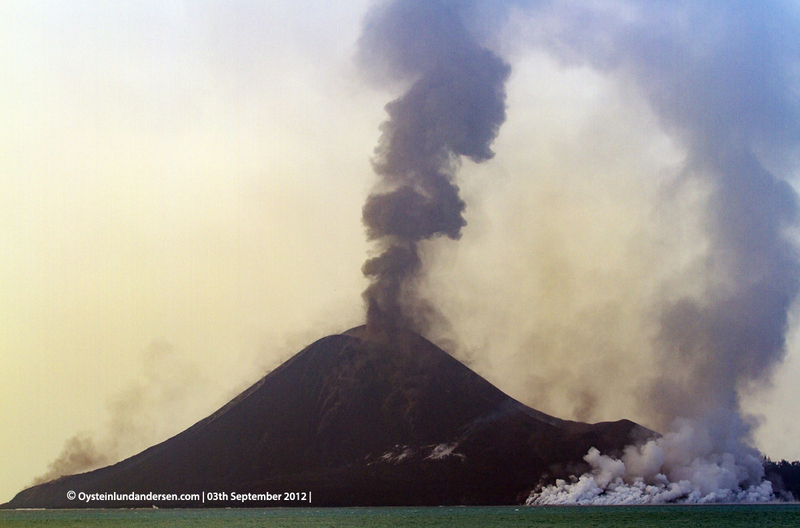 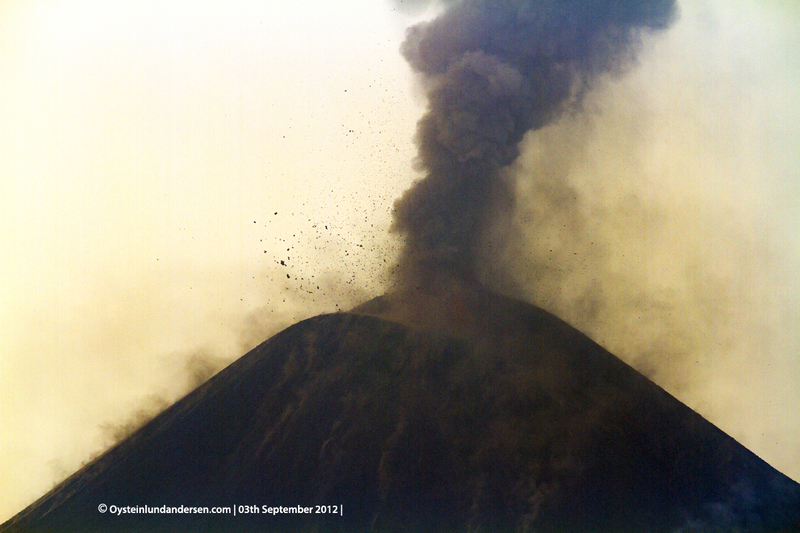 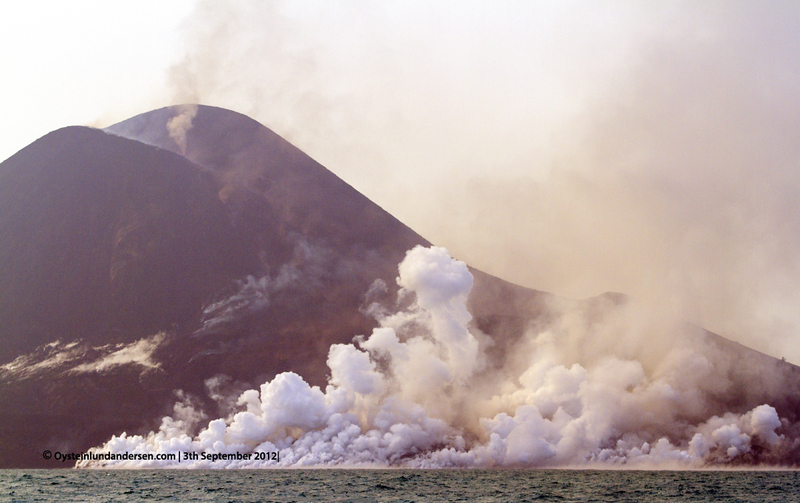 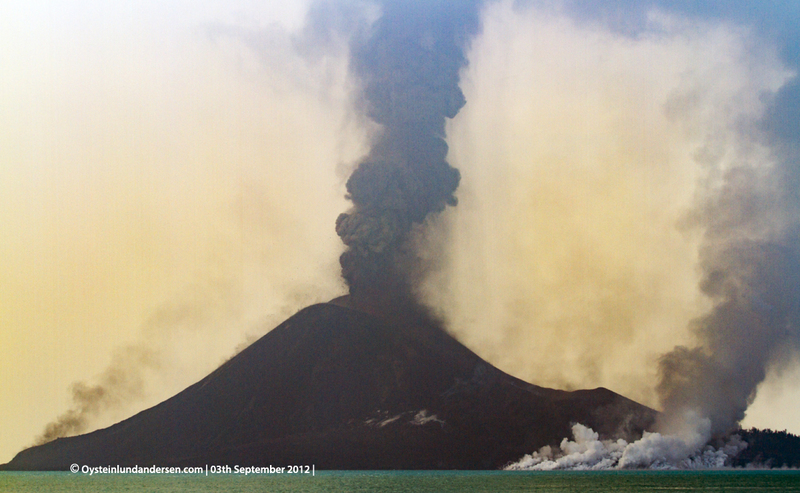 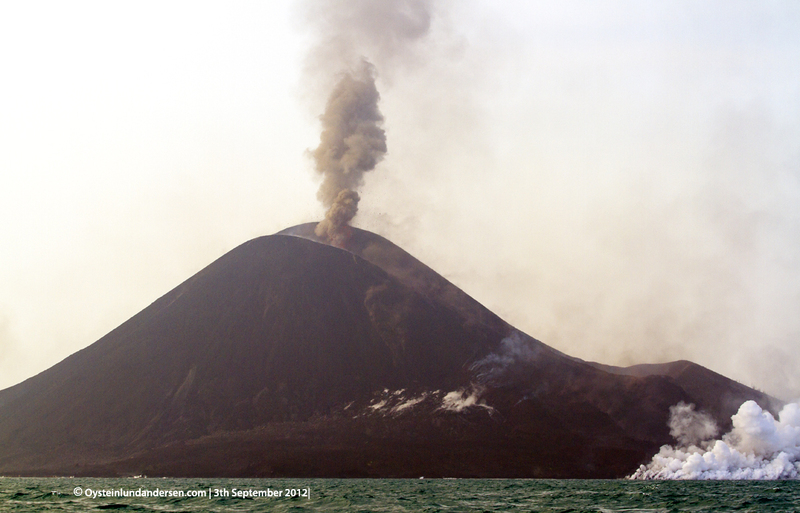 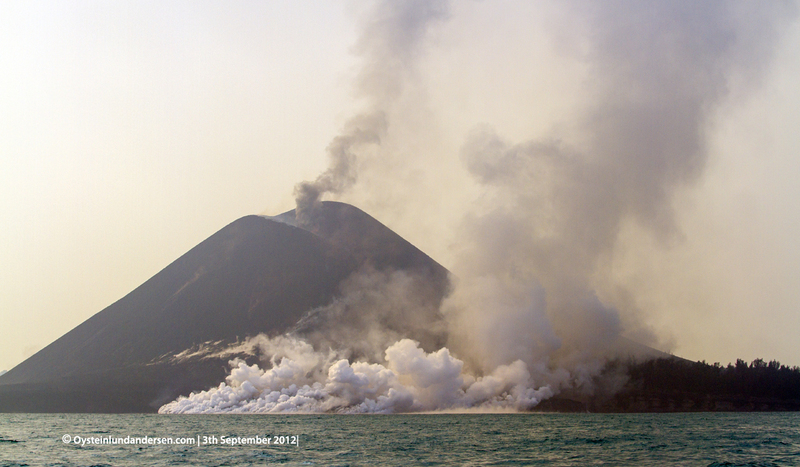 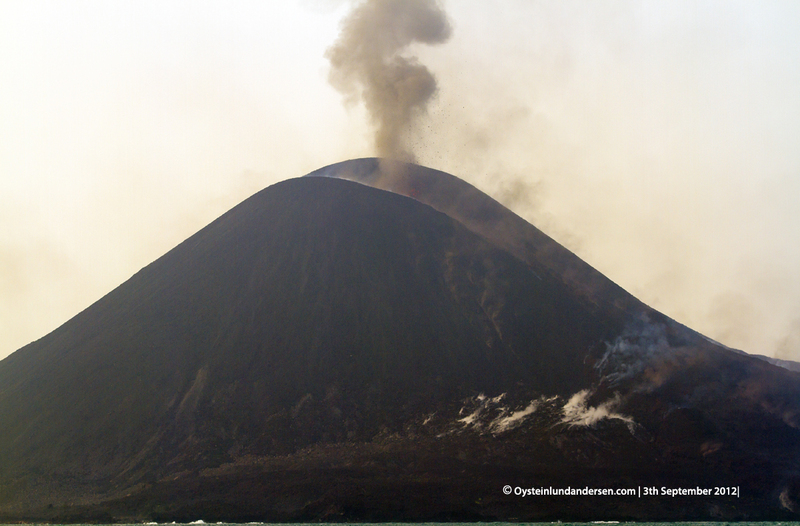 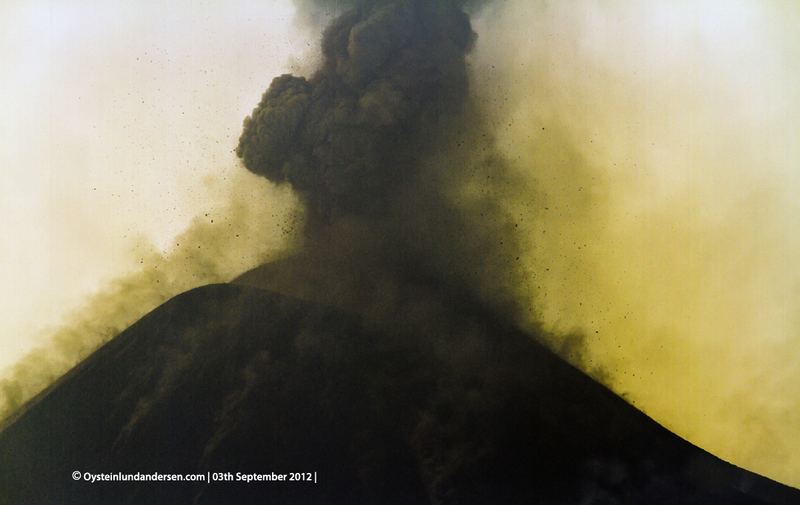 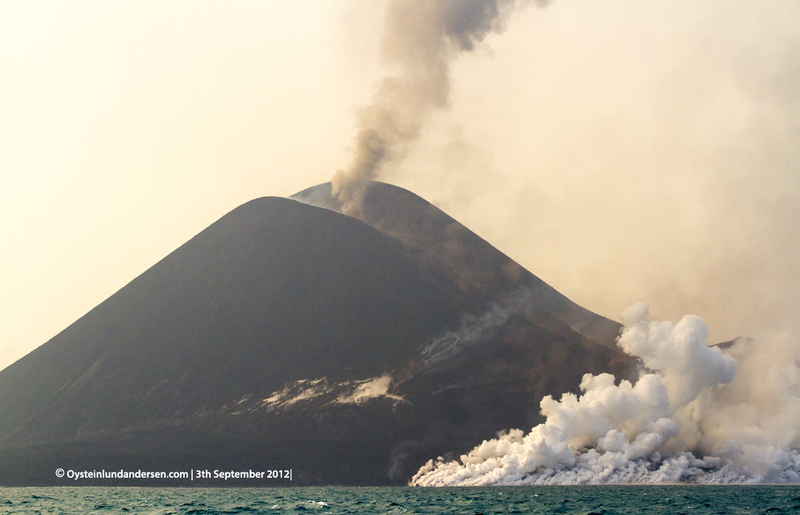 Krakatau volcano is now seeing a major increase in activity. 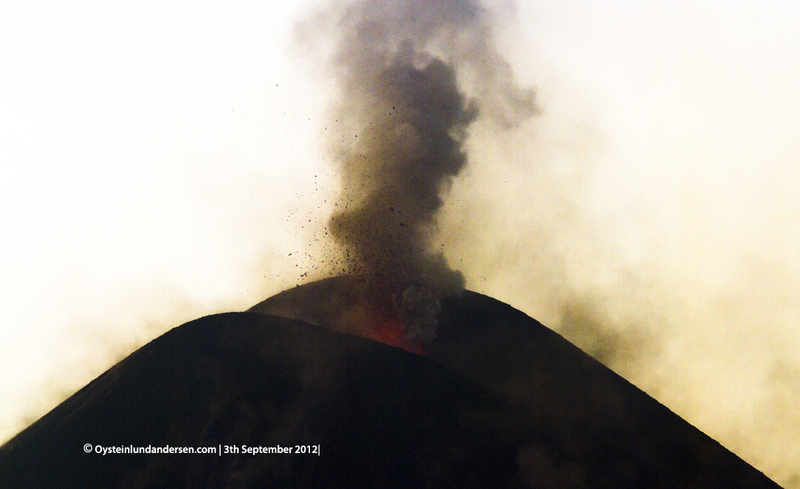 On Sunday 3rd September, large booming sounds could be heard in the villages of Carita and Anyar. 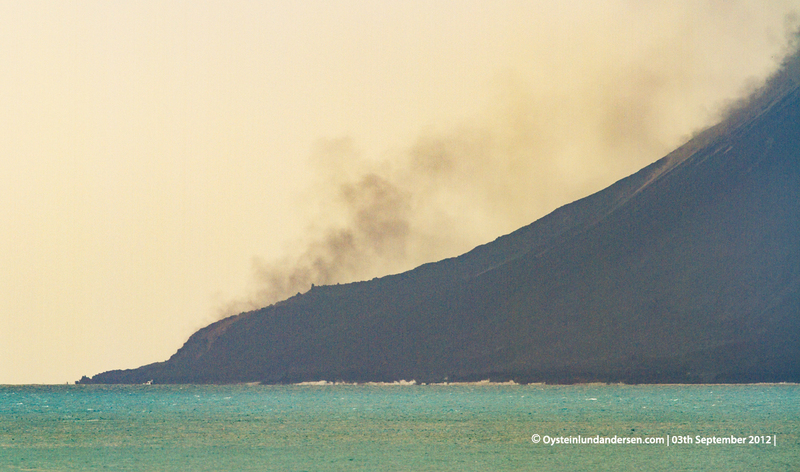 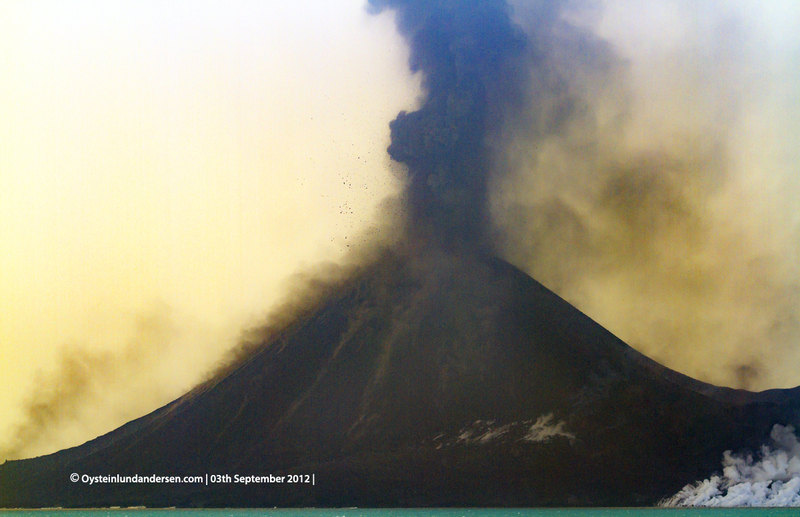 Enroute to Krakatau in the morning, we heard continuous booming noises half way from Java, and as we approached the volcano, we could see an high plume from Anak Krakatau`s main vent, lava bombs was ejected 2-300m up in the air. 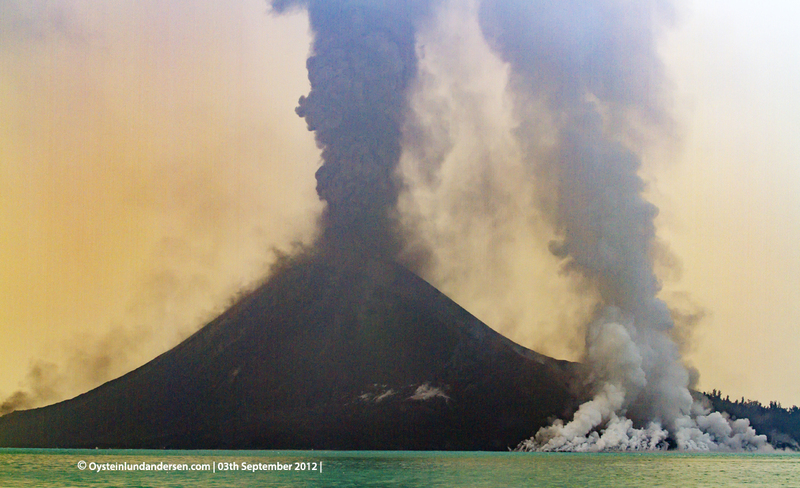 The ash column mainly drifted towards Sumatra, according to observations and news reported from the Sumatran city of Lampung. 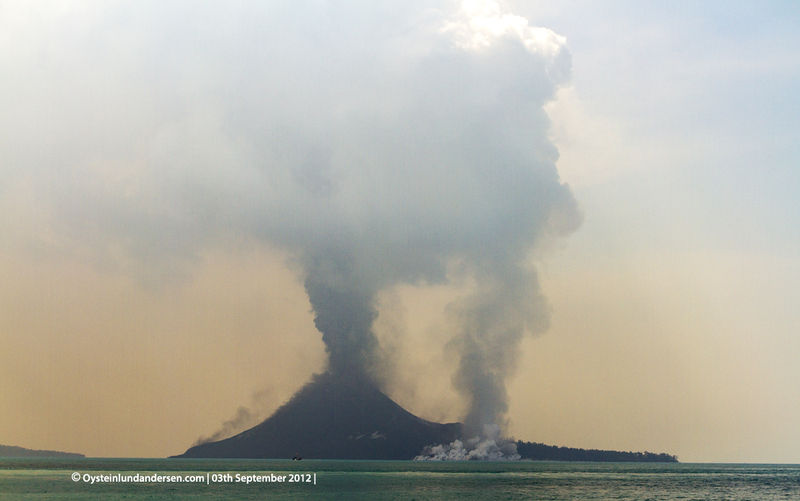 More significantly, we also noted very soon, an area on the south-eastern shore of Anak-Krakatau that emitted a large plume of steam. 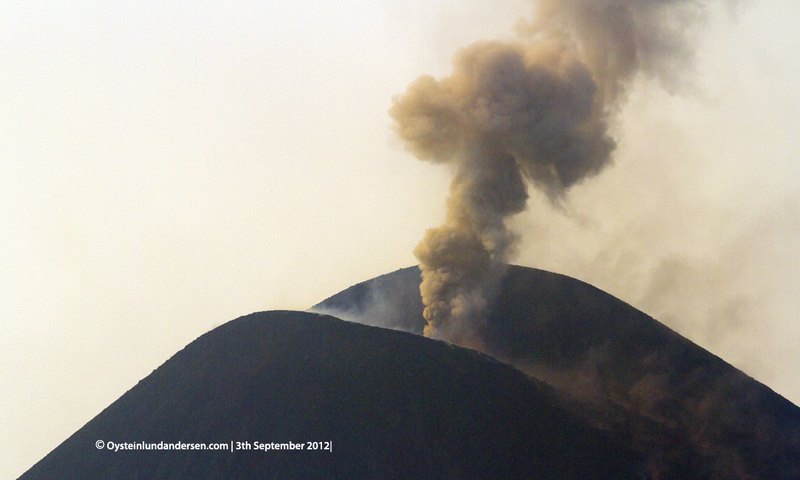 The local crew/guides who joined our group looked very surprised and worried, as we all noticed these major changes. 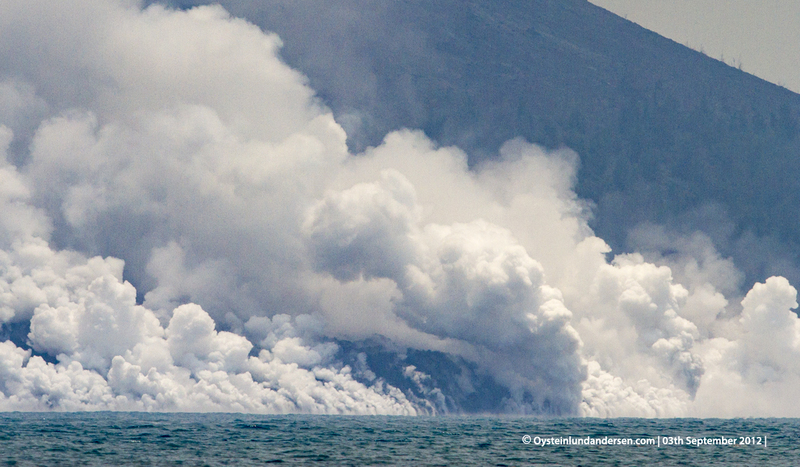 I first thought this was the result of new geothermal activity, but first realized later that this was in fact two new lava flow. 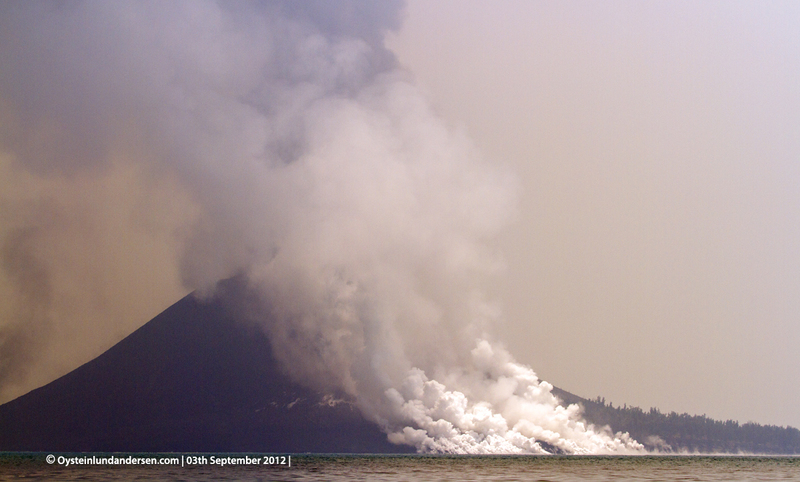 The lava flow have extended the seashore on the eastern side of Anak by some (maybe up to 100m), apparent in the satellite images I compared below. 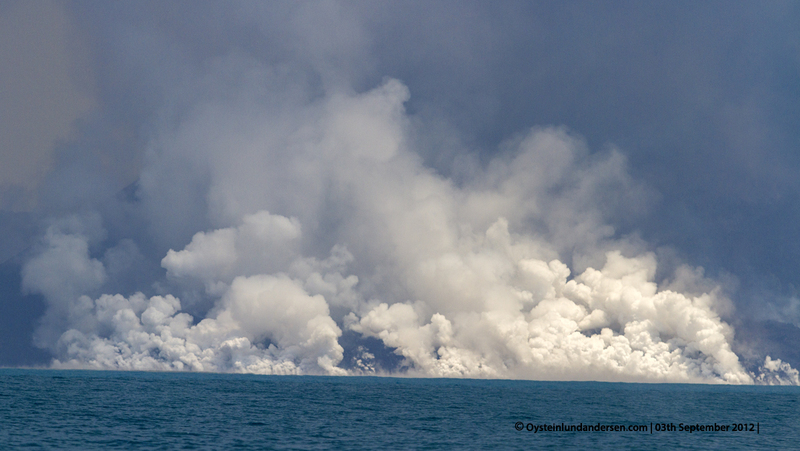 Another lava flow occured on the Western flank, but is smaller than the Eastern lava-flow. 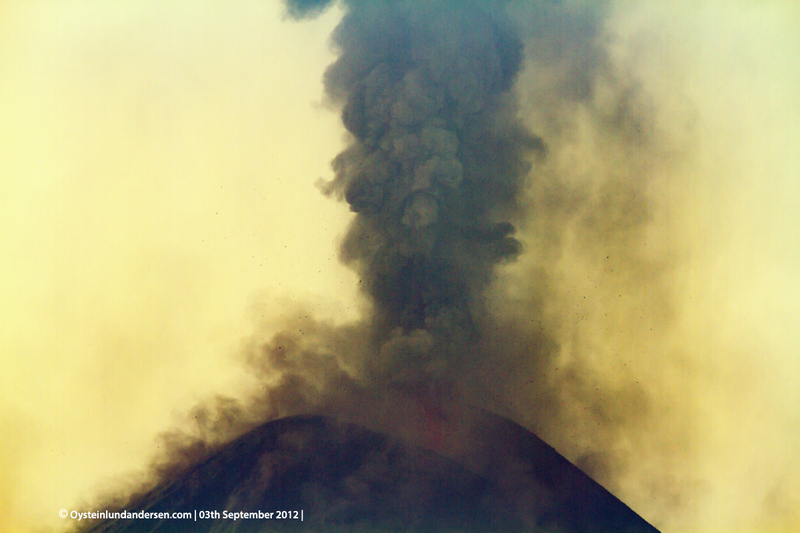 The lava flows probably started on the 2nd of September, and I observed the last hours of its being produced, on the 3rd September. 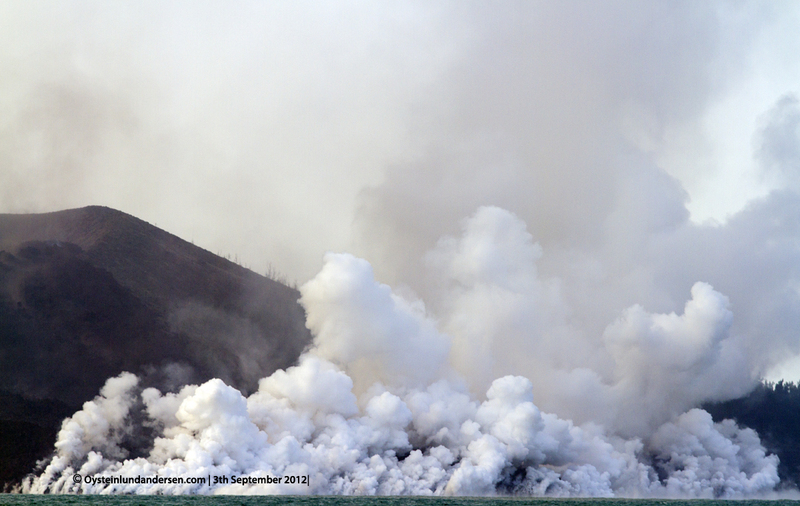 The crater walls on the eastern and western side (above the lava flows) have experienced a partial collapse, evident in the photos underneath. 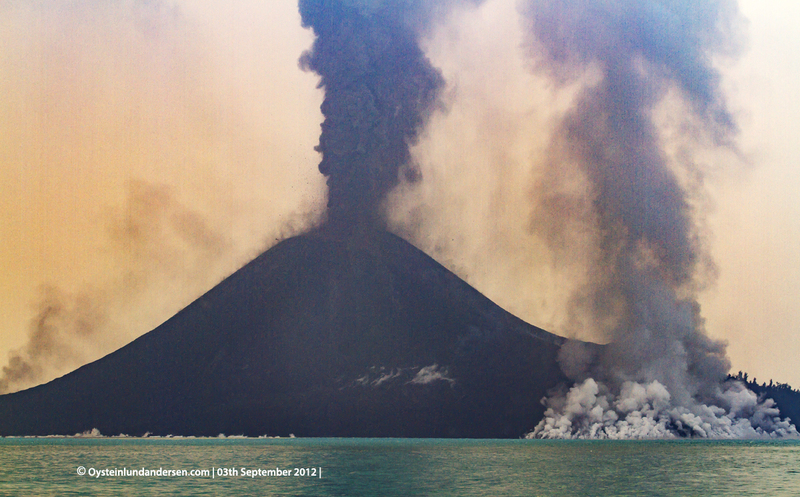 Modis Hotspots were recorded starting the 2nd to the 4th of September, indicating the start and the end of the eruption. 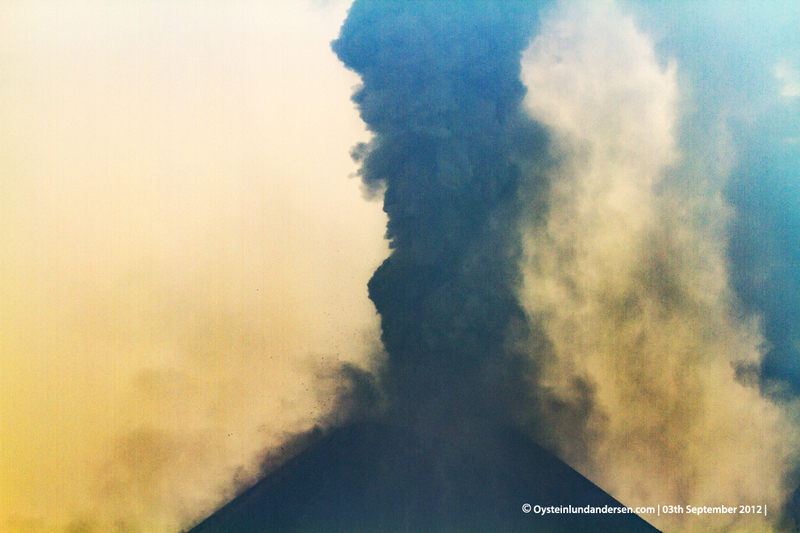 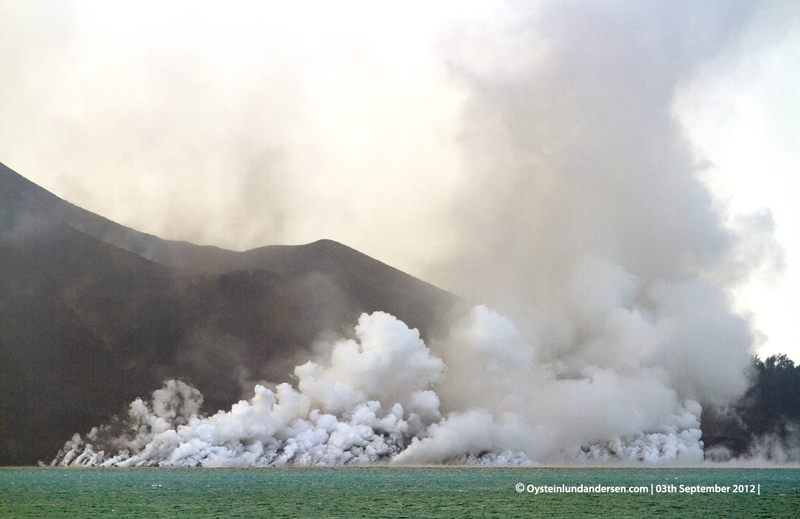 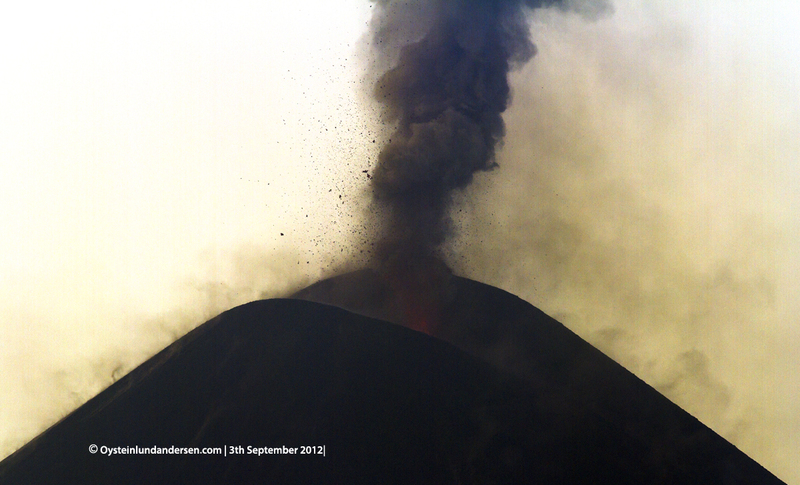 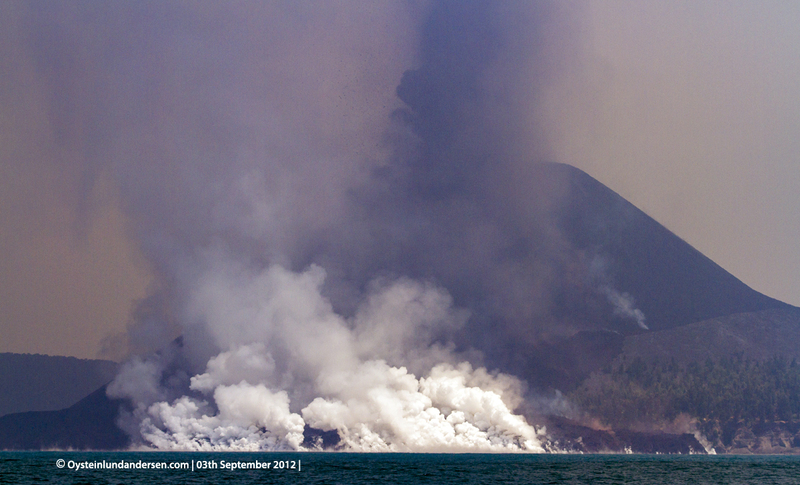 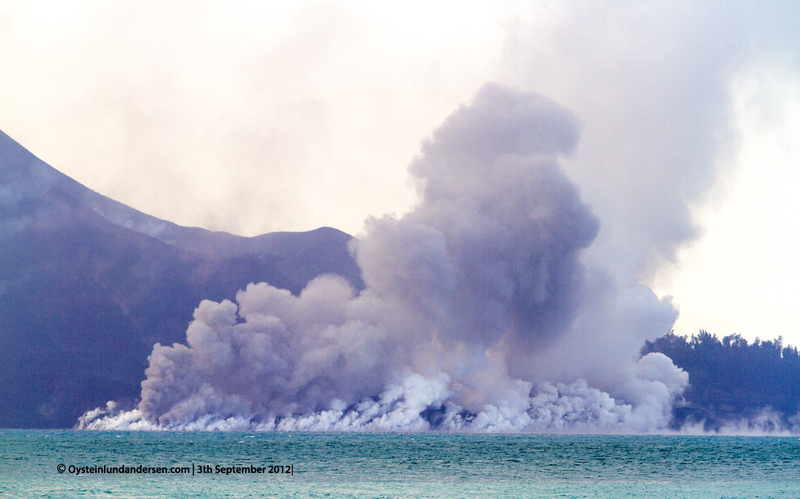 For more photos of the new lava flows, see article-page from my visit to Krakatau from October 2012. 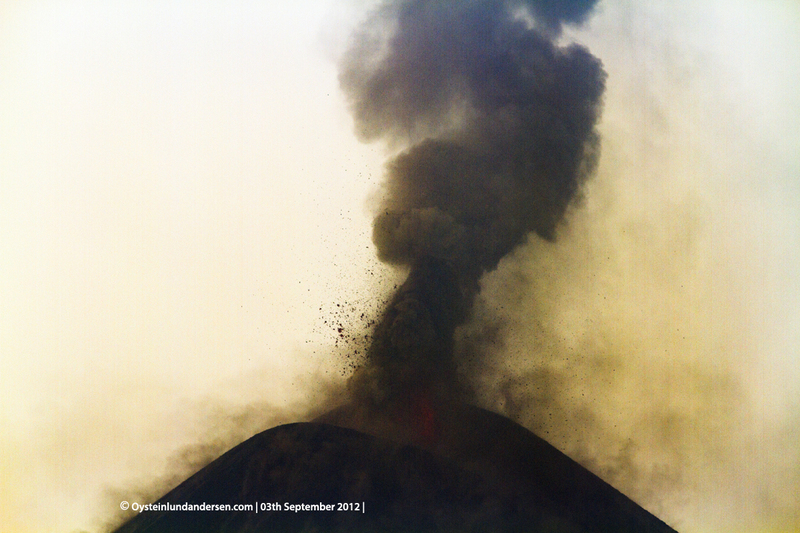 Photo (1). 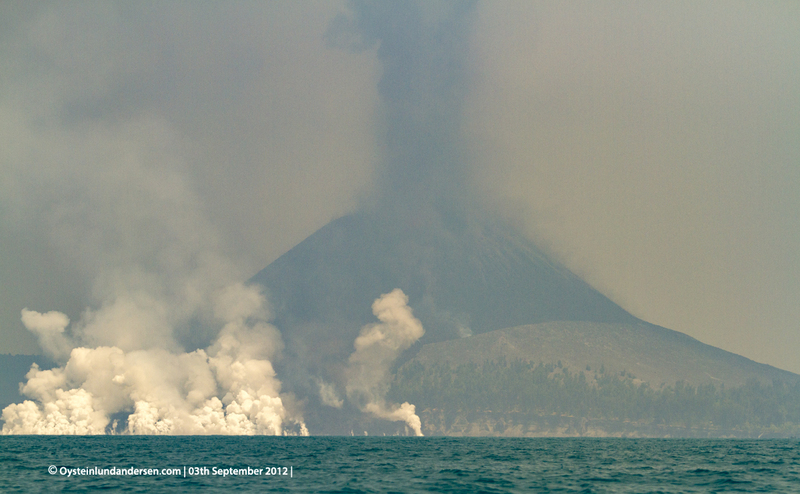 Approaching Krakatau from East. 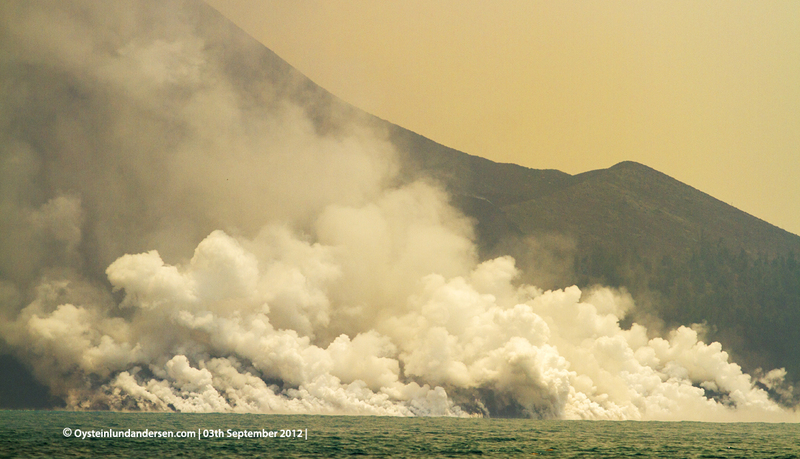 At the time of arrival I thought the steam rising from the sea, was a new vent opening up at sealevel, I was worried. 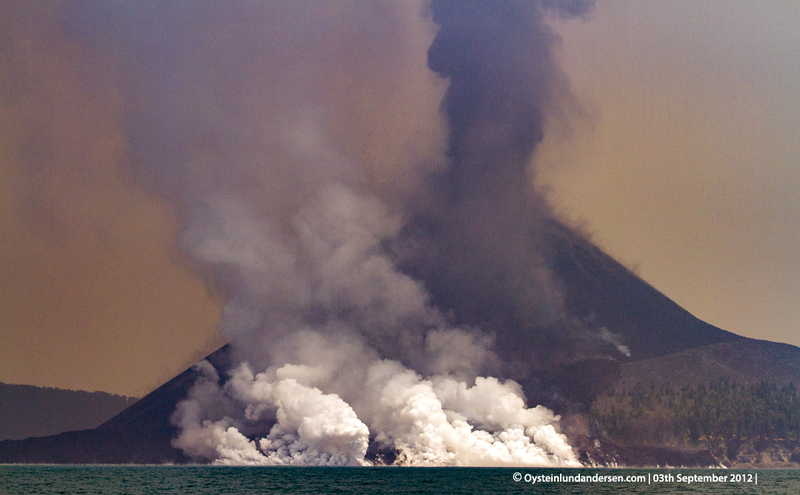 Photo (2) After observing the eruption activity it became apparent that the rising steam from the sea was a lava flow created by the ongoing eruptive activity of the summit-crater. 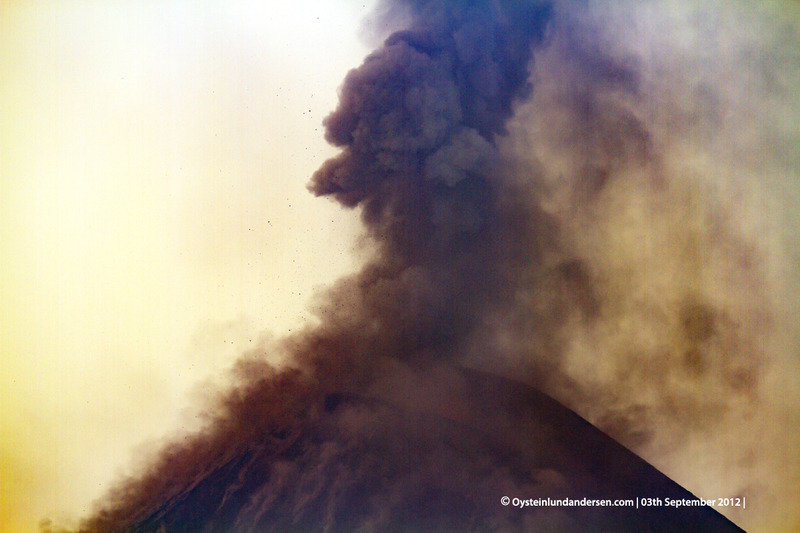 Photo (3) The eruptive activity was continious, constant booming noises were heard and lava bombs were ejected to heights of several hundread meters. 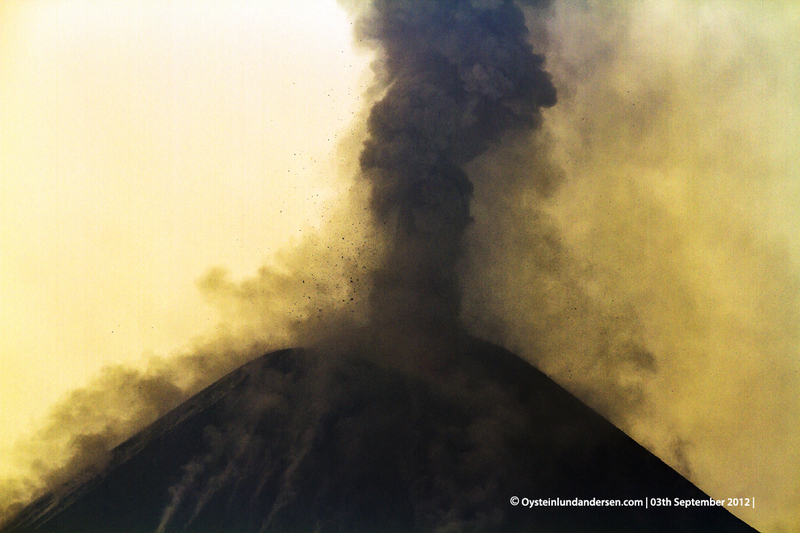 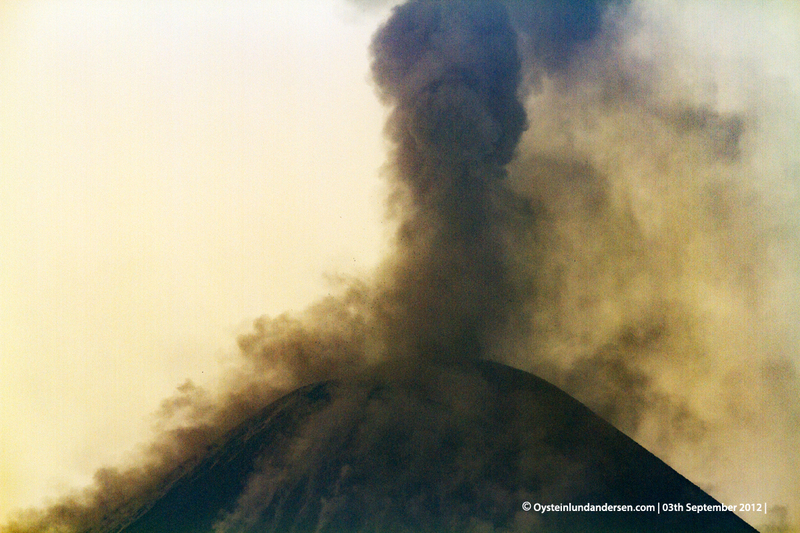 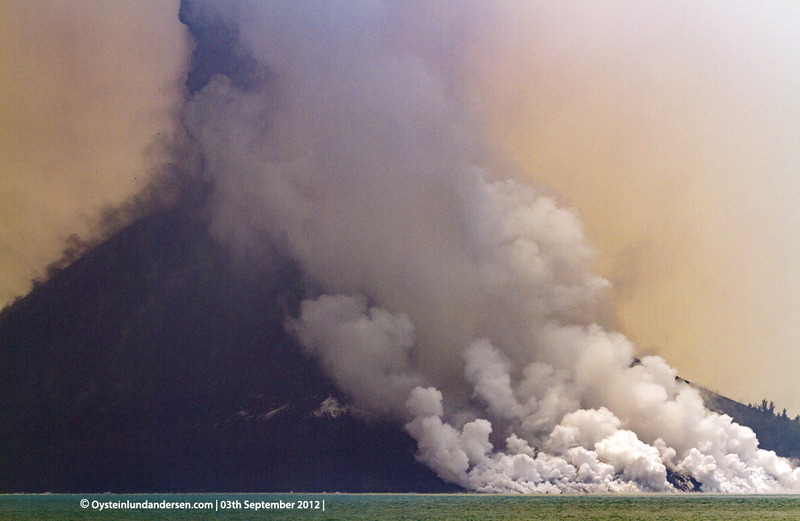 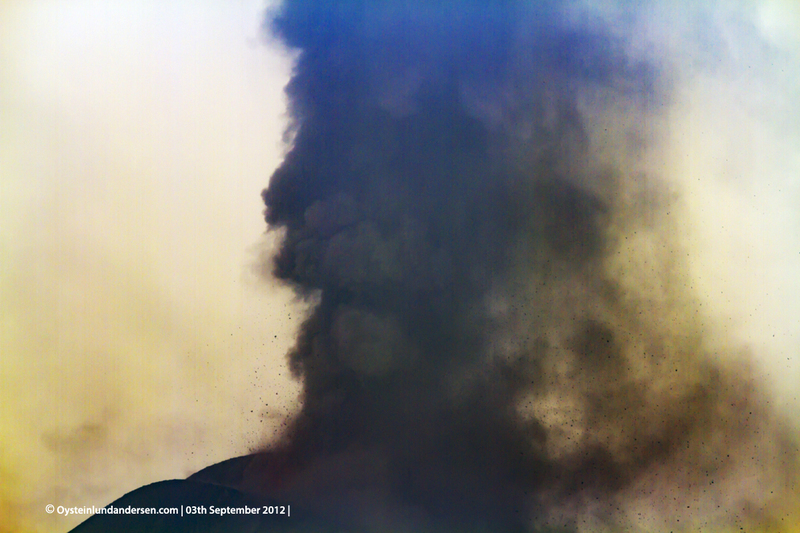 The eruption plume contained medium amounts of ash, making the visibility very poor. 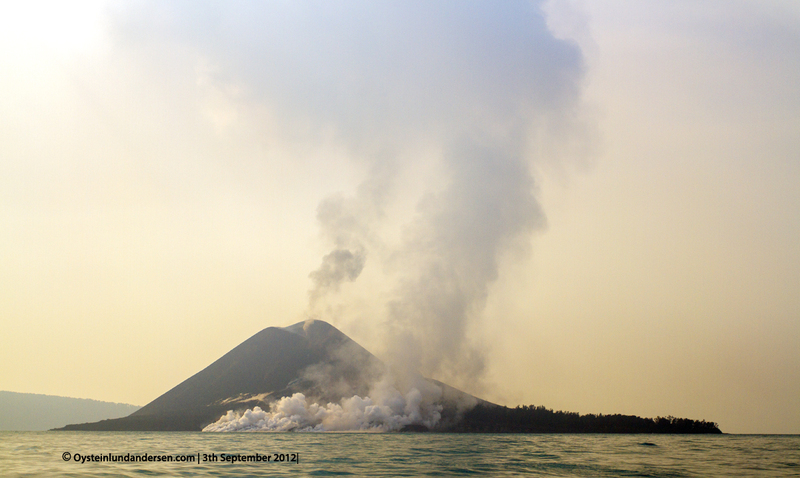 Photo (11) View from Rakata island. 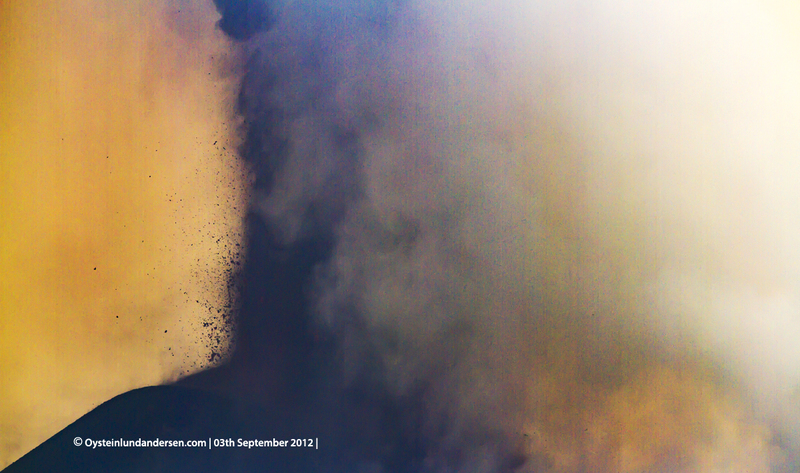 Photo (29) Close up of the ejecta being expelled from the crater. 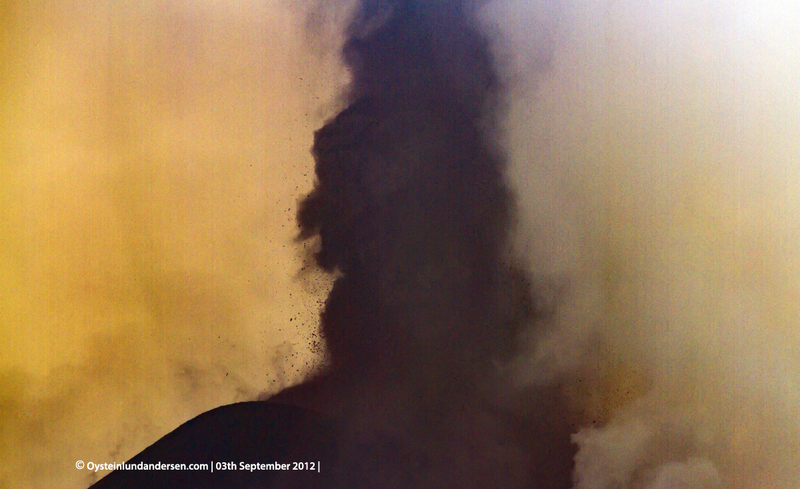 Photo (35) There were sometimes small explotions near the edge of the lava flow. 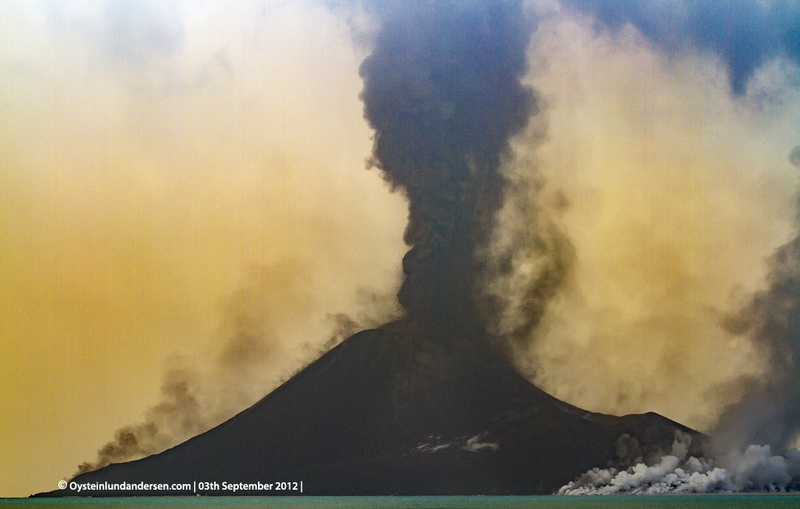 Photo (37) In the afternoon the eruption decreased in intensity, and the visibility got better. 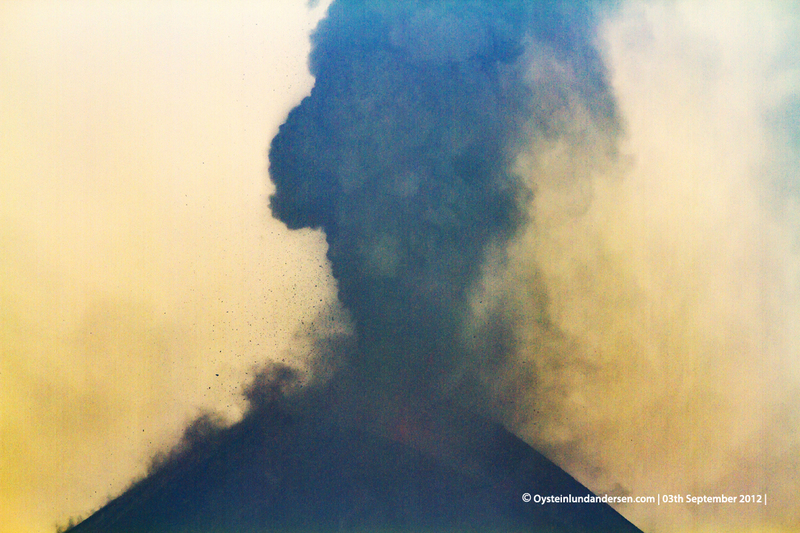 On this photo you can see the red-color of the ejecta. 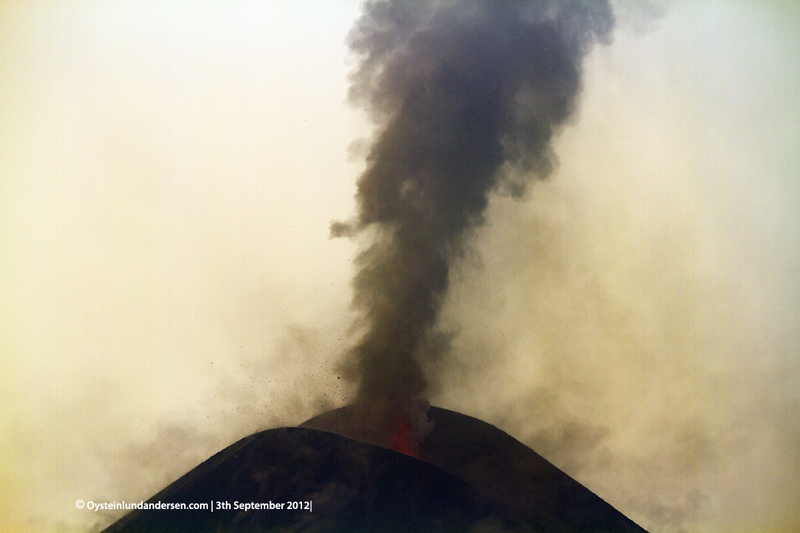 Photo (38) The summit was reshaped by the eruption, and got a more irregular shape compared to the wide summit crater it use to have. 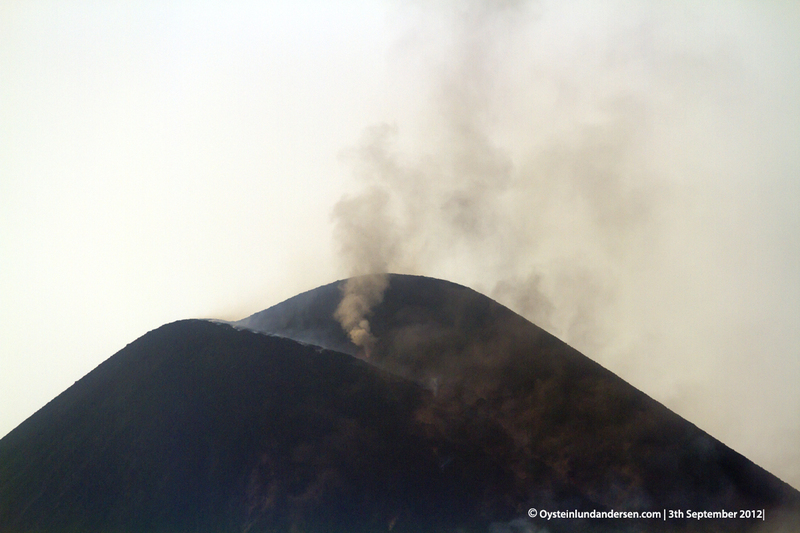 The crater walls on the western and eastern side of the summit, have partly collapsed due to the material that made up the lava flow, I figure. 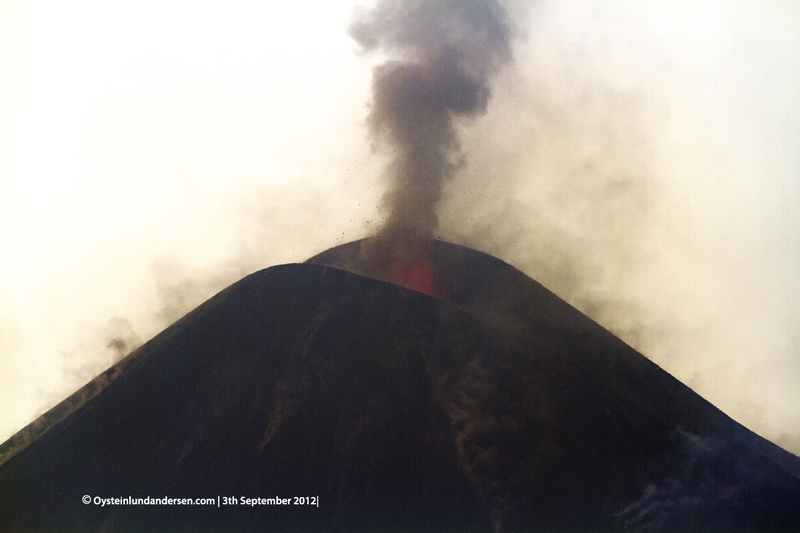 Photo (42) Close up on the summit. 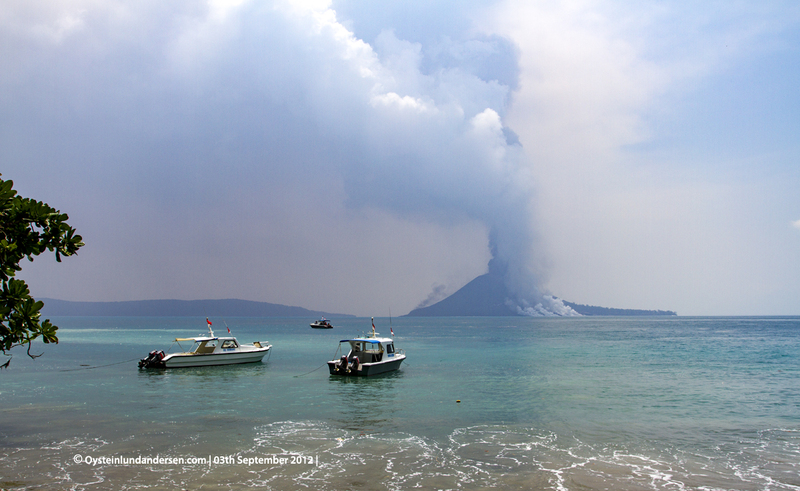 Photo (47) Leaving Krakatau, as the eruption vaned further. 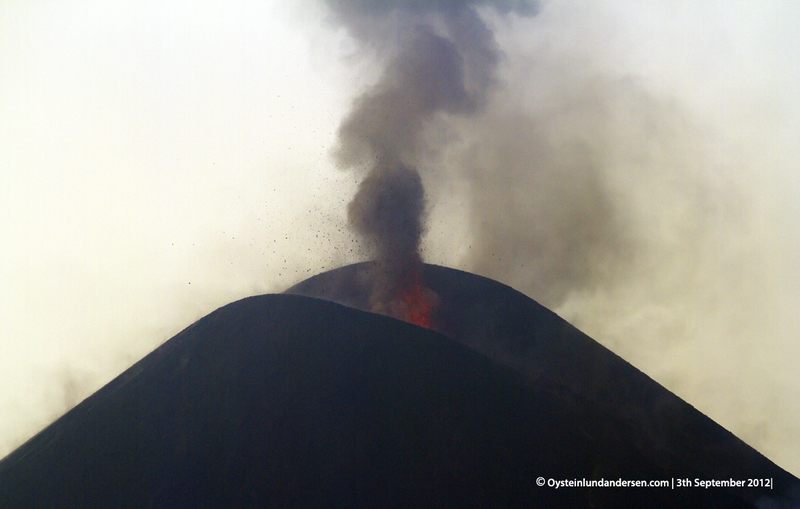 According to one of my friends who chose to overnight at Rakata island, only a few small eruptive events happened during the night, and the next morning it had ended. 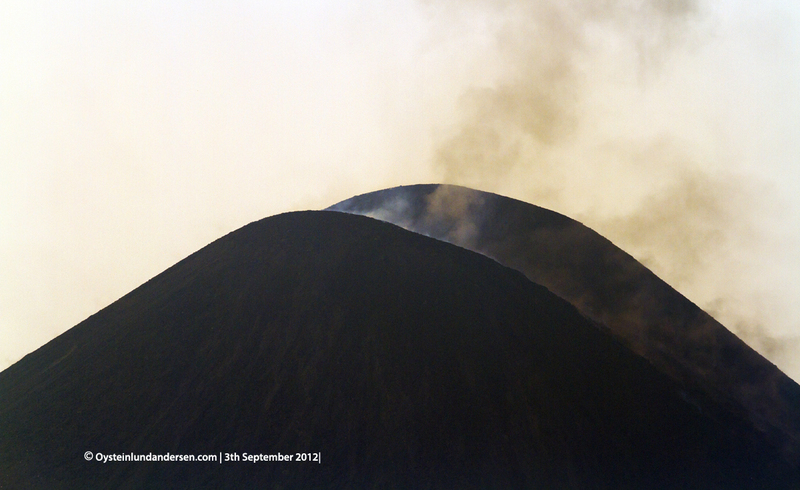 The lava flow was still hot and glowing during the night, according to him.